The Font of Knowledge: Ireland and neutrality. In Times of War. 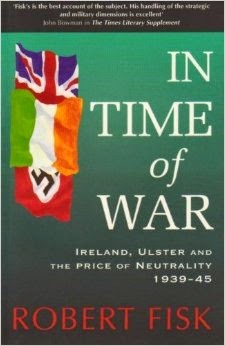 Ireland, Ulster and the Price of Neutrality, 1939-1945. By Robert Fisk. André Deutsch, London, 1983. pp XVI + 565. I borrowed this book from the RDS library. 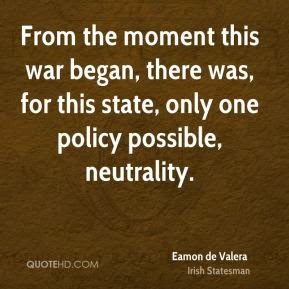 It is a rather unnecessarily long account of Ireland’s international role before and during the second World War but it is a mine of detail about De Valera’s stance on the issue of neutrality. Dev was of course supported in his policy by the vast majority of the people of the Republic and by all Irish politicians with the exception of James Dillon. De Valera emerges as an incorruptible leader who was implacable in his defence of neutrality and in his stubborn resistance to the British attempts for Ireland to join in the war and for Ireland to yield on the Treaty Ports which had been returned to Ireland in 1938. Behind Ireland’s public stance on neutrality was of course the great majority of the Irish people’s sympathy for the Allies and the increasingly strong but secret cooperation which Ireland gave to the British in terms of information and assistance in releasing members of the British army, navy and air force who had found themselves for one reason or another on Free State soil. There is a huge amount of detail in the book about actual or alleged spying, on both the German and British sides. On this issue and from the personal points of view, Richard Mulcahy is widely reported because of the considerable number of papers he left in the UCD archives in relation to the Defence Council which was set up during the war in Ireland. He and Dr. Tom O’Higgins represented Fine Gail on the Defence Council. 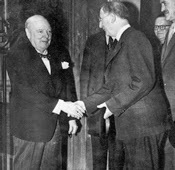 Churchill and De Valera meet in 1953. The British in general and Churchill in particular had little appreciation of the motives which determined Ireland’s neutrality, and Churchill could be both arrogant and undiplomatic in dealing with De Valera whom he learned to hate because of Dev’s stubborn stance. There is no doubt that the loss of the ports was a serious problem for the British, particularly during the early years of the war when shipping losses proved to be very threatening and at times reached as much as 400,000 tons in one month. In later years, as the submarine menace came under better control, the loss of the ports was less significant. 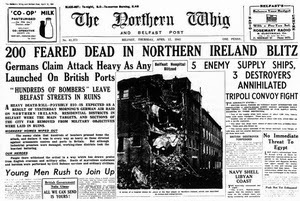 However, the pressure on De Valera and the Irish Government to yield on the ports continued up to the end of the war. Apart from details about Ireland’s stance, Fisk deals in considerable detail with the North of Ireland and with its own problems during the period. There is a detailed account of the disastrous bombing of Belfast which caused considerable distress in relation to refugees and the low morale of the Belfast citizens. There is little doubt that Ireland’s neutrality and the North’s readiness to join in the war lead to widening the division of the two parts of Ireland. It was certainly responsible for consolidating partition in the minds of the Northern loyalists and the British. However, at no time had the British confirmed its stated commitment to support the North until 1948 when Jack Costello abolished the External Relations Act. By creating the Republic outside the Commonwealth he was to precipitate the British guarantees to the North of Ireland. The Northern Loyalists would receive the full support of Britain unless the majority of people in the Province wished to return to a united Ireland. The British were angry at Ireland’s unexpected defection from the Commonwealth and the British guarantees added fuel to the fire of the anti-partition campaign which De Valera had started after he had lost the 1948 election. Costello became equally vocal about partition and the North’s intransigence, thus further alienating the North and consolidating rather than solving the northern problem. He was angry following the British assurances but he only had himself to blame having left the Commonwealth without seeking the views of the leader of his party, Richard Mulcahy, and clearly ignoring the traditional support of the Commonwealth by his party members. Mulcahy (3rd from right) elected President of Fine Gael. Costello on his left. It is not relevant to Robert Fisk’s detailed account of Ireland’s neutrality but it can be only a source of disappointment that Richard Mulcahy who, as the newly elected President of Fine Gael in 1944, declared his full support for Commonwealth membership, accepted Costello’s decision without demurring. I was with him at breakfast at Lissenfield when the Sunday Independent arrived with the news. The declaration of the Republic and the departure from the Commonwealth came as a complete surprise to him but the only comment he apparently ever made on the issue outside my presence was, when travelling by car to Cobh with Paddy Lynch to meet Jack Costello on his return from Canada, he said to Paddy ‘Jack must have had a drink too many when he made the declaration’. I can only explain my father’s unexpected acquiescence to three possible factors - his loyalty to his close friend Costello, his very Victorian commitment to the authority of the head of government and, perhaps above all, his reluctance to disturb the harmony of the rather fragile Interparty government with the consequent danger of De Valera returning to power. Nevertheless, I believe my father was too committed to loyalty not to express his criticism about an act which was in his view inconsistent to the fundamental policy stated by him when elected head of his Party in 1944. And loyalty was a constant feature of his life even when he was challenged by authority whose action he might disapprove of.